Local food cart serves up more than great food | Audio and video stories from Southwest Washington. For the full story, watch the video above. Just a hop, skip and a jump north of the Kiggins Theater, you will find the home of a downtown Vancouver landmark: The Wiener Wagon. 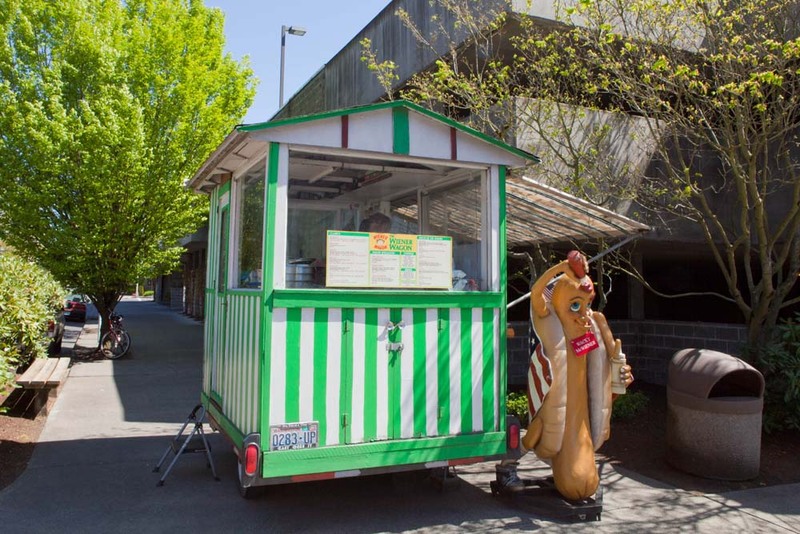 You can’t miss it – the mascot Wacky McWiener stands tall next to the green and white striped food cart. 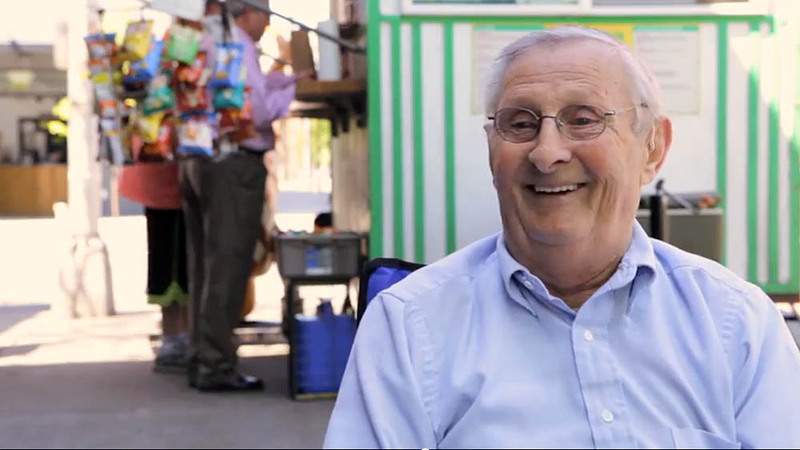 Skip Ballweber started doing business as a street vendor in 1976, originally at 11th and Main. About a year and half later the cart moved to its current location on 12th and main. He owned up to five wagons over the years, but today he has scaled down to just one. He likes it that way, it gives him more time to talk with patrons. 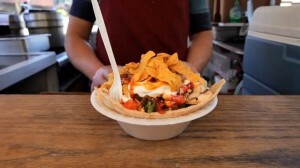 Over the years the menu has grown to include taco salads along with favorites like Dan and Georges’ Chop Chop, Odessa, Denise’s Works or Skip’s Favorite. There’s a story behind each one of them. Just ask Skip or Robin. In 1981, longtime employee Robin Povec passed the Wiener Wagon while on the way to the beach with friends. Upon asking Skip for a job, he replied, “you can start tomorrow, but you will need to wear shoes.” Robin has been working on and off at the wagon ever since. “I love it and I want to do it until she no longer can.” Said Robin. Today, Skip is transitioning into retirement. If you are lucky enough to find Skip at the Wagon, you’ll most likely to find him visiting with the regulars and stepping in the cart as needed. Over the next couple of years, the tongs will be officially passed to Robin’s very capable hands. Though situated on a busy street corner, there is a relaxed, friendly atmosphere around the Wiener Wagon. Customers are often addressed by name and asked if they want the usual. It’s a winning combination for the Wiener Wagon: Low prices, generous portions, and loyal friends. So, if you are looking for a quick tasty lunch, stop in for a visit. The Wiener Wagon is open from 10 am to 3 pm most days. COUV.COM normally promotes healthy eating options. On your cheat day, we recommend trying a dog with all the trimmings. It has taken two years of construction, more than 160,000 man hours and 3.8 miles of shelf space, but the Fort Vancouver Regional Library District is ready for its next chapter as it debuts Vancouver’s newest library July 17. The new facility replaces the old main community library that has stood at the corner of Mill Plain and Fort Vancouver Way for nearly fifty years.